For anyone who has ever used an iPhone or iPad, you know there is a powerful video camera inside that can shoot phenomenal HD video and is incredibly easy to use . But simply shooting video is only one step to visualizing and digitizing your creative efforts. 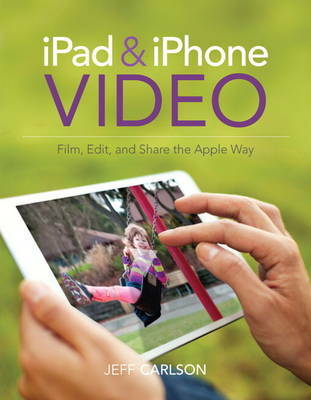 In iPad and iPhone Video, bestselling author Jeff Carlson shows you how to best harness the powers of these remarkable devices. Jeff explores all the steps to shooting great video in a variety of scenarios, from outdoor sunny arenas to dark concert venues. He'll explain everything you need to know about editing the results in order to tell your story better and to give polish with attention to color, light, audio, and more. Once you're happy with the results, he'll give you the step-by-step details for sharing the video via YouTube and Vimeo and give you best practices for keeping friends, family, and other audiences in the loop. With over 300 million iPads and iPhones sold, consumers around the world already own the most versatile filmmaking tool ever made... they just don't know it yet! This book will help them understand and unlock the potential packed into every one of these devices.